2018 brought many changes in our lives. I am still with Lexington Law and celebrated my 4 anniversary in December and was recognized at our Christmas luncheon. My nephew Josh and his gf announced they were expecting and we are excited to welcome our great niece in June. Looking to include a visit to them while in WA. Brad had double hernia surgery in December. We celebrated 21 years of marriage on October 11th. The biggest change occurred though with our address. In December we made the decision to leave The Nelson Penthouse and move in with Brad's 90 year old father so he can remain in his home and not worry about having to go Assisted Living. yes it is a big adjustment but worth it as Herb says on a daily basis it is nice to not be alone. Brad has decided to attend the reunion with me this time and I look forward to introducing him to the Class of 79. Excited to see everyone and catch up. Will always be thankful for my time with the bowling team - I truly felt I belonged. My lack of all things that made you popular did not matter. Sheri Caldwell Nelson posted a message on Jerrilyn Wilson's Profile. Sheri Caldwell Nelson updated profile. View. Sheri Caldwell Nelson has a birthday today. 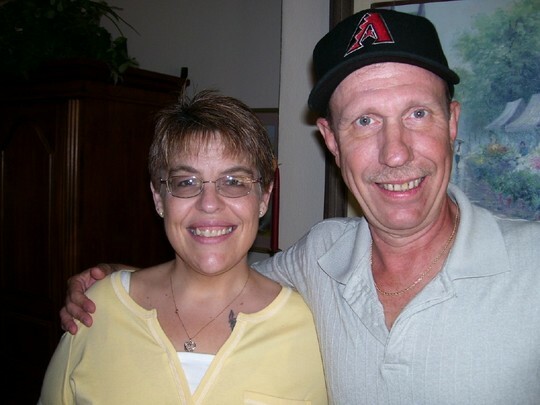 Brad and I at his father's 80th birthday party 11/30/08 in Phoenix. Myself and my cousin, YES, my cousin, although we didn't know it at the time, Ruth Drollinger at the reunion. Jerrilyn Wilson Makins and I at the Friday night get together portion of the reunion. Sally Shockley Thaxton and I...what a great lady and friend she is.